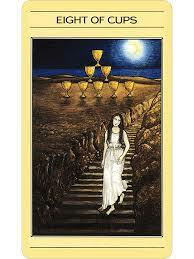 Psyche, like Persephone has her own journey to take, that involves disappointment, escapism and ultimately change. The Moon lights Psyche's way in spite of her not knowing what lies in wait, as she descends the steps into darkness, and is fearful that she may not return and might face imminent death. She's been on a quest for love that involves healing a split. She's been under the illusion that she needs to over ride her feelings, her intuition, and the dreams that inform her of the truth of life. She does not have answers, but she knows she must have courage, a willingness to listen to her inner wisdom, and to the wisdom of the earth that begs for change. Psyche does eventually return, a changed individual, after learning the task of discrimination, how to curb her generosity, to set boundaries, and to say no. She has found her way on the road of trials and she is strengthened, healed and transformed, because she has endured. Her search for illusory love has been de-mythologized, resulting in her own autonomy, achievement and nurturance. Eros and Psyche are no longer split and have been reunited within herself. and be heard deep and wide. This could have been written especially for me today. It really touches me on a soul level. I wish descending one time and then be healed and restored again like Psyche would be enough in real life too. But it feels like we have to make this journey over and over again and our healing is a life long process. I glad that my post has touched you Ellen. We are never completely healed in life, of this I am certain. But we can have a sense of wholeness. Remember Persephone spends three months out of the year in the underworld with Hades. We can do what we can do to help ourselves, sometimes meaning we ask for help or we reach a point of acceptance. Sometimes the only resolution is to accept that there is no resolution. Acceptance is healing for me.